Beirut ­ More than four years after the February 2005 assassination of former prime minister Rafik Hariri, UN Secretary General Ban Ki-moon announced that the Special Tribunal for Lebanon would begin functioning on March 1, 2009 in The Hague. Following is a list of political events in Lebanon shortly before Hariri was assassinated and after. - September 2, 2004: the United Nations Security Council adopts resolution 1559 concerning the situation in the Middle East, calling for the withdrawal of all foreign forces from Lebanon - meaning Syrian troops. - September 3, 2004: Under pressure from the Syrian regime, Rafik Hariri's bloc approves the extension law for President Lahoud. - September 3, 2004: The Lebanese parliament adopts the extension law for President Lahoud and forwards it to the Lebanese government for execution. - September 7, 2004: Economy Minister Marwan Hamadeh, Culture Minister Ghazi Aridi, Minister of Refugee Affairs Abdullah Farhat and Environment Minister Fares Boueiz, resign from the cabinet in protest at the constitutional amendment extending Lahoud's term. - September 9, 2004: Prime Minister Rafik Hariri indicates to journalists that he will resign from government in a move to show his protest against the extension of the term of Lahoud. - October 1, 2004: Assassination attempt on Marwan Hamadeh, in Beirut, Lebanon. - October 4, 2004: Rafik Hariri resigns as prime minister. - October 11, 2004: Syrian President Bashar Assad delivers a speech condemning his critics within Lebanon and the United Nations. - October 19, 2004: United Nations Security Council expresses concern that resolution 1559 has not been implemented. - October 20, 2004: President Lahoud accepts Hariri's resignation and names Omar Karami to form a new government. - February 14, 2005: Rafik Hariri and 20 other individuals are killed in a massive blast in a seafront area of central Beirut. - February 25, 2005: The United Nations Fact-Finding Mission arrives in Lebanon. 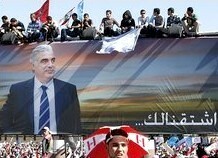 - February 28, 2005: Pro-Syrian Prime Minister Omar Karami resigns. - March 14, 2005: A Christian/Sunni-led demonstration demands the withdrawal of Syrian troops and the arrest of the chief of the security and intelligence services. - March 25, 2005: the United Nations Fact-Finding Mission issues its report in New York. - April 7, 2005: The Security Council forms the United Nations International Independent Investigation Commission into the assassination of Rafik Hariri and 20 others on 14 February 2005. - April 26, 2005: The last Syrian troops leave Lebanon ending a 29- year military presence. - April 26, 2005: The United Nations Verification Mission starts its mission to verify the complete withdrawal of Syrian military and intelligence agents from Lebanon and its full compliance with resolution 1559. - May 30, 2005: First round of elections held. The Rafik Hariri Martyr List, a coalition of Saad Hariri's Future Movement, won the majority of the seats in parliament. - June 2, 2005: Journalist Samir Kassir is killed when his car explodes in east Beirut. - June 16, 2005: UN investigation into Hariri's killing starts. - June 21, 2005: Former Lebanese Communist Party leader George Hawi is killed when his car explodes close to his home in Muslim West Beirut. - June 30, 2005: Fouad Seniora, former finance minister under Rafik Hariri, forms a new government composed of 23 ministers. - July 12, 2005: Defence Minister Elias Murr is wounded and two other people are killed in a car bomb attack in Beirut. - September 25, 2005: A car bomb injures prominent news anchor, May Chidiac, in north Beirut. - October 20, 2005: UN investigators say high-ranking Syrian officials and their Lebanese allies were involved in Hariri's killing, in a report to UN Security Council. Syria denies it. - December 12, 2005: Jubran Tueni, anti-Syrian member of parliament and Lebanese newspaper magnate, is killed by a car bomb near Beirut. - July 12, 2006: Hezbollah captures two Israeli soldiers in cross- border raid, setting off 34-day war in which some 1,200 people in Lebanon and 158 Israelis were killed. - November 11, 2006: Five pro-Syrian Shi'ite Muslim ministers from Hezbollah and its ally, the Amal movement, resign after collapse of all-party talks on giving their camp more say in government. - November 21, 2006: Industry Minister Pierre Gemayel is killed by gunmen. UN Security Council approves plans for tribunal to try suspects in assassination of Hariri and subsequent attacks. - December 1, 2006: Hezbollah, Amal and supporters of Christian leader Michel Aoun camp outside Prime Minister Fouad Siniora's office in central Beirut in open-ended campaign to topple government. - March 8/9, 2007: Talks between parliament Speaker Nabih Berri, also leader of the opposition Amal movement, and majority leader Saad Hariri to solve the four-month-old power struggle, end without agreement. - May 17, 2007: The United States, France and Britain circulate a draft UN resolution that would unilaterally establish a tribunal to try suspects in the 2005 Hariri murder. - May 20, 2007: Lebanon's army battle Fatah al-Islam militants accused of robbing a bank a day earlier. The ensuing clashes kill thirteen soldiers and 19 militants. - June 13, 2007: Anti-Syrian parliamentarian Walid Eido and five other people killed by a car bomb near a Beirut beach club. - September 2, 2007: Lebanese troops seize complete control of Nahr al-Bared camp after months of fighting which kills over 300 people in the worst internal violence since the civil war. - September 19, 2007: Car bomb in Beirut kills seven people, including Anti-Syrian Christian lawmaker Antoine Ghanem. - November 10, 2007: Parliament postpones a presidential election in a bid to break a deadlock over a consensus candidate and end the political crisis. France leads mediation efforts to reach agreement on a presidential candidate. - November 20, 2007: - Lebanese army tightens security in Beirut as parliament session meets to elect a successor to Lahoud, delayed for two days to Nov. 23. - November 23, 2007: Parliament postpones vote again after rival leaders failed to agree on candidate. New session set for November 30. Lahoud leaves presidential palace causing a power vacuum in Lebanon. Prime Minister Fouad Siniora says his cabinet will assume powers of presidency. - December 12, 2007: Car bomb kills General Francois al-Hajj, who had been tipped to become army chief. - January 25, 2008: Captain Wissam Eid killed in a bomb blast. Eid was responsible for a security branch analyzing sensitive data (phone calls..etc) that could prove to be used as evidence in the international tribunal. 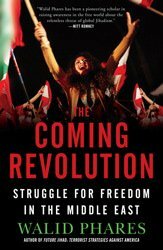 - May 8-13, 2008: At least 80 people are killed in clashes between Hezbollah and pro-government factions, sparking fears of civil war. - May 25, 2008: Parliament elects army chief Michel Suleiman as president, ending six-month-long political deadlock. - May 28, 2008: President Suleiman reappoints Fouad Siniora as prime minister, entrusting to him the task of forming new unity government. - July 11, 2008: Political leaders reach agreement on make-up of national unity government. - July 12, 2008: President Suleiman meets Syrian President Bashar al- Assad in Paris. They agree to work towards establishing full diplomatic relations between their countries. - October 14, 2008: Lebanon establishes diplomatic relations with Syria for first time since both countries gained independence in 1940s. - February 23, 2009: ­ UN Chief investigator in the Hariri case Danielle Bellamare pays farewell visits to Lebanese leaders before he leaves for The Hague to launch the UN special tribunal for the Hariri case on March 1st.